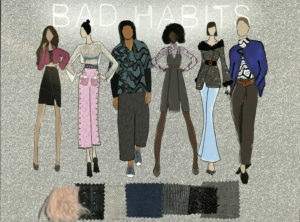 “Bad Habits” is a streetwear collection consisting of both men and womenswear looks. 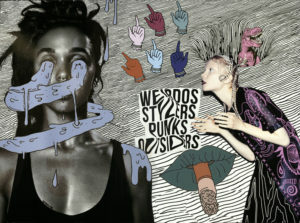 Most of my inspiration was found in graphic art work, more specifically the contrast between heavy black lines and vibrant colors. I plan on sourcing fabric with interesting textures in addition to creating my own print and embroidery designs. Grommets and exposed zippers will also be incorporated in order to bring out a more edgy, urban street style appearance that ideally would appeal to those who might be considered rule breakers or who tend to fall outside the norms of society.